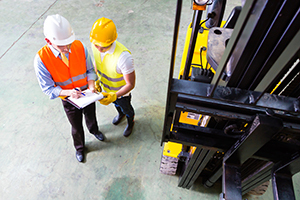 The Industrial Truck Association (ITA) is sponsoring National Forklift Safety Day and works with OSHA to provide training seminars and develop safety materials to ensure the ongoing safety of forklift operators. Employers must ensure that each worker is competent to operate a powered industrial truck safely, according to 29 CFR 1910.178(I)(1). The yearly event places emphasis on important issues like recognizing hazards, management commitment, codes and standards, and operator training. OSHA provides materials for supervisors to distribute during the event.